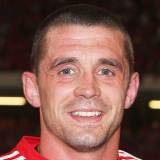 Quinlan battled several injury set-backs to build a formidable reputation as one of Ireland's most valuable forwards. Equally able in the back-row or second-row, he made his senior debut at the 1999 Rugby World Cup as a replacement against Romania, and made his Six Nations bow against Italy in 2001. After dislocating his shoulder at the 2003 Rugby World Cup, he played just six more times for Ireland over the following four years due to lack of fitness and form. His Test career will be most remembered for the try he scored in the crucial win over Argentina in the pool stages of the 2003 tournament - he scored a total of three tries at that Rugby World Cup before his untimely injury. A cruciate ligament injury to his right knee meant the 2005-06 season was almost a write-off but he worked his way back to full fitness and, in May 2006, won both the AIB League Division title with Shannon and the Heineken Cup with Munster. Another Heineken Cup triumph followed in 2008 and Quinlan was also part of the Munster side that claimed the 2008-09 Magners League crown. He returned to the international stage as a 34-year-old in 2008 for the autumn clashes with Canada and New Zealand but played no part in the following year's Six Nations. He caught the eye of Lions head coach Ian McGeechan however, who selected him to tour South Africa later that year, but a subsequent 12-week ban ended his tour hopes. He was found guilty of making contact with the eye area of Leinster skipper Leo Cullen during their Heineken Cup semi-final at Croke Park. Two years later Quinlan called time on an illustrious career, announcing that he would retire at the end of the 2010-11 season.